When you plugin your iPhone (or iPod touch) into your Mac either iPhoto or Aperture get automatically launched. Reason for this is so any photos can be imported from the iPhone to your Mac. You can disable this (or change the application that is started) using the “Image Capture” application (located in the Applications folder). 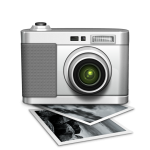 Start up Image Capture and select your iPhone in the Devices list. Once thats done you should have a drop down at the bottom of the list that allows you to select which application you want to automatically launch whenever the iPhone is plugged in. Thank you, this worked perfectly! I appreciate you posting this.